He grew up in Liverpool where he had his first lessons on the tin whistle, but learned to play the pipes in Canada, a student of the well-loved Toronto piper and teacher Chris Langan. 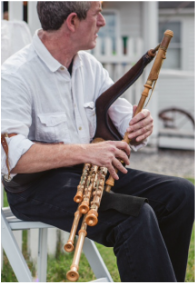 Patrick Hutchinson is an internationally recognized performer and teacher of the Irish Uilleann pipes, with more than thirty years exerience and an eclectic repertoire that encompasses both the traditional and the experimental. Patrick has appeared on WGBH's A Celtic Sojourn, with the Cambridge Revels, and on recordings by Loreena McKennitt and Oliver Schroer, among others. He has provided the music for many theatrical productions including Brian Friel's Translations, Frank McGuinness's Observe the Sons of Ulster Marching Towards the Somme, and Carthaginians, and his piping can be heard in the Highlander movies. He holds a Ph.D in ethnomusicology from Brown University, which he did in order to write about his teacher, Chris. Currently, he teaches pipes for the Comhaltas Boston Music School. 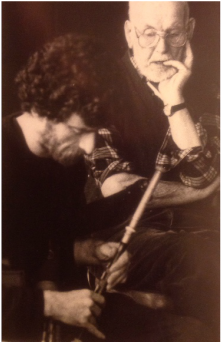 He twice won the All-Ireland title in Uilleann Pipes Slow Airs, twenty-two years apart, most recently in 2014 in Sligo. You can find Patrick teaching in the Video Tutor section of the Na Píobairí Uilleann website at pipers.ie. He is known for his own unique settings, and for bringing to light tunes long buried.